Posted by santos. This entry was posted on 20050129 at 3:15 AM You can skip to the end and leave a response. hi stel! have you seen your car yet?! ;-) i was actually thinking about you when i posted this. i thought, hm, drstel should make these when she's trapped in the house with the kids--they can attach them to string and make earmuffs :-D warm and toasty--and then merienda! Yum Yum. Sri Lankans make a similiar bun called maspung (sic). Basically meat in bread. However the meat filling is spicey spicey and the bread is soft and delicious. My mouth is watering just thinking about it!! My mom used to make the steamed version, supao. As little kids, we didn't like the traditional filling since we were so Americanized by then. So she used to make hot dog versions for us. Now, I can't get enough of the traditional kind! 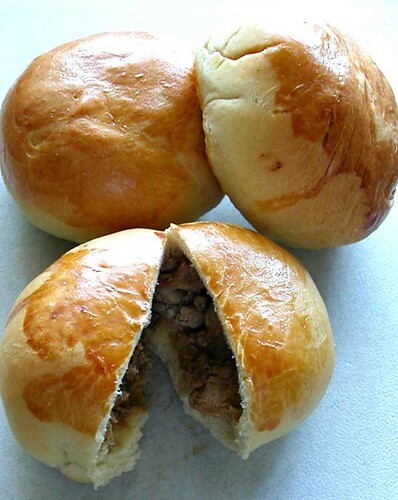 Yum, this looks good, reminds me a bit of char siu buns which I really miss. I make adobo so often, so this is one idea to develope that further. hi saffron--ooh. sri lankan? what's the filling for those?